STUFFED ROULADEN are buttered with mustard, then stuffed with bacon, onions, parsley, dill pickle and carrots. Smoked Kassler 3 4 lbs Pork Loin / kraut SUPER GOOD! These are raised with no chemicals. Fresh Raised rabbit. They are very meaty!! 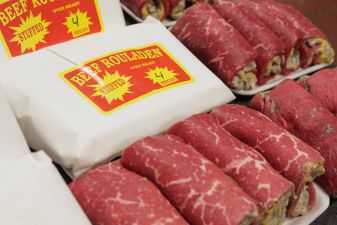 Rouladen Meal WHAT A GREAT GIFT!